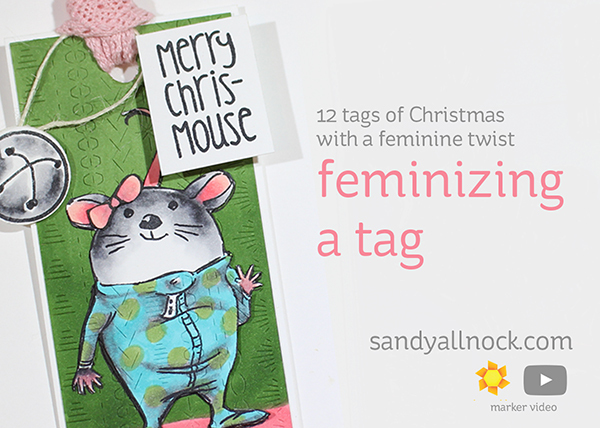 12 Tags of Christmas with a feminine twist! There are a number of things you can do to any image or tag to make it more girly….color, texture, bling, dimension….anything “fussy” turns most anything into a project that’ll appeal to us girls! 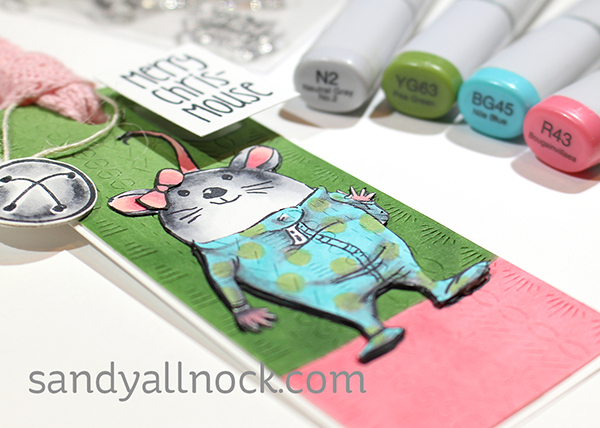 I chose to add color and texture to this cute little mouse – as well as adding a little bow on her head! Watch the video below or click HERE to see it in HD on YouTube. My Detail Scissors adventure mentioned in the video – no worries, the sheath was on, I forgot to mention it – but the scissors did a good job holding up to puppy teeth on this one! OH my goodness… I absolutely adore tag!!!! This mouse is so stinkin’ adorable!!!! I would never dream of throwing out your tag that I have! I keep it out all year! I love the little mouse! Thank you for that great tip on simply shading the footies. This is such a wonderfully cute tag. So cute, so adorable love it love it….now another stamps set I want/need..I need a sugar daddy for sure…lol! love this tag so much!!! I don’t have many site that I follow… But I never miss yours. Thank you, thank you, thank you for sharing your talents with me and my darling 11 and 8 year old grandsons. You’re the best! Cute tag love the pajamas. Smart to test the colors and then layer on top of your test! Love the little mousey! Oh Sandy, this is fabulous!! I love how you tried the colors, stamped several images to test the color combinations; but mostly I LOVE how you transformed those pajamas!!! I have to confess I’m also a lover of feetie pajamas too. Mine also have booties to match lol in pink!! Really adorable mouse in the pj’s and just beautiful coloring! Thank you for the save idea. The other day I was coloring and I really did not like the combo I thought I would have to scratch the project and start over. Not now I will pull it out and paper piece the section I do not like. While adding dimention what could be better. Thank you. So sweet! Love the color combination! Headed over to watch the video! So adorable. I have been making tags for years. My niece’s and nephews love them and hang them on their tree each year. Makes me feel special and they get the extra special tags. Really cute! Love her footy pajamas!